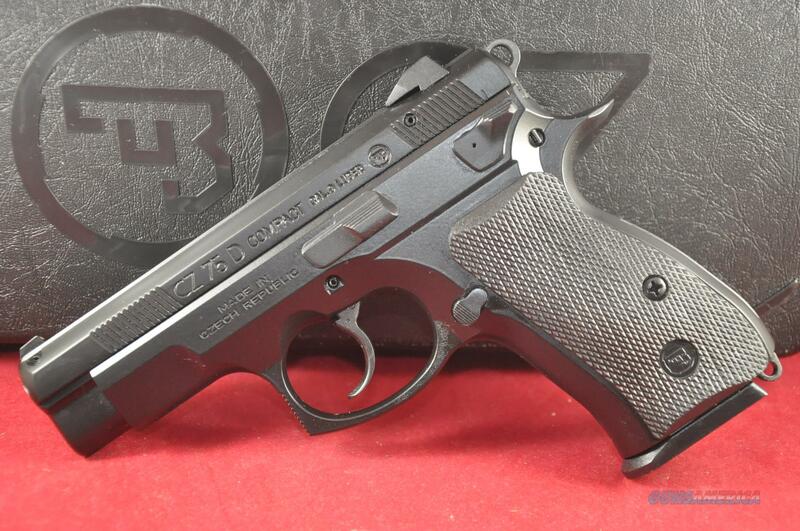 Description: Factory New CZ USA CZ 75D PCR Compact 9MM (CZ01194) with either Two 10 Rounds CZ OEM Magazines OR Two 14 Rounds Mec-Gar CZ Magazines. Terms and Conditions: Please Check Your Local and State Laws Before Bidding. Other states may also prohibit you from owning a firearm or item that is legal in other states. Make sure to know your State laws before you buy. It is your responsibility to know your state laws. LAYAWAY TERMS: If you need layaway, please read all the details below before bidding on the auction. If you have any questions please email me BEFORE bidding. 1. Make a 20% down payment to start the layaway. Down payment has to be made within 10 days after auctions ends. 2. Layaway has to be paid in USPS Money Order, Cashier Check or Personal Check. No credit card for layaway. Personal check requires up to 10-day holding period. 3. You have 180 days (6-month) to pay in full. There is never a penalty for paying off early. 4. Layaway is only available for "Buy It Now" option. The Penny Auctions or Bid Wins do not qualify for layaway. 5. The Layaway down payment is nonrefundable and nontransferable. If 180 days pass without us getting the full payment, the item and down payment will be forfeited. CALIFORNIA: We are now enrolled in the CFLC system and will ship qualifying firearms to any eligible FFL in California. It is up to you to find out if the gun is legal or not. Please only bid AFTER you confirm it with your local FFL. We do not ship handguns that are not on the DOJ roster list! PAYMENT: No credit card fee. Credit Card payment through GunBroker Checkout is preferred. Self checkout can be completed via the Gunbroker checkout system. LOCAL PICKUP: Please TEXT or email for local pickup. Shipping charge will be refunded if you paid for it. $10 transfer fee for CHL/LTC holder. $20 transfer fee for non-CHL/LTC. CANCEL/RETURN POLICY: A 10% restocking fee plus return shipping will be incurred if you cancelled the order or you ordered the wrong item or item is not allowed in your state. Return will be accepted on firearms that arrive other than advertised in the listing. Returns MUST be left with the transferring dealer. If a customer takes possession of the firearm, we consider this acceptance of the condition, and will not offer a return. Firearms returned for any reason other than damage or mis-advertised will be subject to a 10% restocking fee. PICTURES: We use STOCK PHOTO for all our auctions meaning the pictures we use are the same photo on every auction and not the EXACT serial numbered firearm you will receive! FFL: It is buyer's responsibility to have the receiving FFL provide FFL copy via email or fax to us. We will NOT ship your item until we have the FFL copy from the receiving FFL. Please E-mail (Ask Seller a Question) or TEXT @ for ANY Questions before bidding/buying! Please visit for more product selections. Cell is for TEXT only. Fax: 4696330216.